Woke up today feeling nauseous and coughing. Sigh. The cigarette smoke in the restaurants really set off my allergies. We had a bit of trouble finding breakfast, since we wanted to make the 10:00 service and most of the cafes didn't open till 10. We ended up eating at Burger King. Piece of trivia for you.... the Brits think that you should put tomatoes, or tomato sauce on your eggs. Not picante, which of course, I could understand, but more like spaghetti sauce or barbeque sauce. So the egg muffin thing had tomato sauce on it. We all agreed, less than satisfactory, but it was quick and got us to the church on time. The building is just breathtaking. It's one of the largest cathedrals in England. Row after row of stain glass windows. Many from the Middle Ages. The Minster was spared destruction in the reformation, and then again during the English Civil War in the mid-ish 1600s. Now before I go on, should we stop for a moment for a Minster break? What the heck is a Minster? And how is it different from a Cathedral? And what about the term Church? I was wondering the same thing myself and the bulletin for the service this morning answered the questions on the back page. It said that a Minster is a missionary church built to bring Christianity to an area. So it's a big deal to be a Minster. It means the church is really old, probably the first church started in that area. A Cathedral on the other hand is the seat for a diocese, in this case York. A Cathedral will have a bishop, (well, and lots of other goodies.) A Church is any place the Eucharist (Lord's Supper) is celebrated. So are we clear on that? York Minster is a Minster, a Cathedral, as well as a Church. So I'm sure all of you know that the G8 is meeting at Gleneagles (near Edinborough). We haven't seen news in a week, so I just had the vaguest notion that they were meeting. (You think I've abruptly changed topics don't you? You're thinking, "She must be getting tired, she was telling us about York Minster and now she's going on about the G8." Well, just stay with me, it circles back around. I promise.) This morning's sermon at York Minster was preached by Trish Heywood the Worldwide President of the Mother's Union. (She had a nice banner for her organization in the processional at the beginning.) She reported on the 300,000 people that showed up for a demonstration to try to get the G8 to do something about poverty. The Mother's Union tries to support family and women mothering children. And with the onset of children being the heads of family in Africa because of AIDS, they now encompass them as well. She was terribly polite and was careful to keep a light tone. Tonight at Evensong when we went back to the Cathedral, we heard a sermon by the Dean of York Minster. He felt no need to mince words, and told us that ordinary people like us were going to have to make hard practical decisions if the world was to be a fairer place, a place where poverty is addressed in a meaningful way. All very bracing as we are of course, spending money on travel and hotels and food. We all gave a bit to the Yorkshire Relief fund. Yorkshire has had severe flooding that has left lots of uninsured people homeless. The choir was lovely at both services. York Minster is kind of low-church, so no Latin chants or incense. They sang arrangements of music from the 1700s forward. But still really lovely. The music was so soothing that all three of us fell asleep this evening during one of the pieces. After the morning services at York Minster, we went over to Jorvik. Someone wanted to build a shopping mall in York, and had torn down buildings, but when they did the archaeological survey of the area (which you always have to do here before they'll give you a building permit) they found that a Saxon settlement had been there in the 800-900s. So they excavated this huge area, put most of the stuff in the Yorkshire Museum (which we went to yesterday), created a Disney style ride through the excavation site in the dug out area, and then put the shopping mall on top of it. They also had some people in Garb in another part of the display selling coins, showing little kids how to weave or do leather work. (It was very child friendly.) Actually, our first day in York, we saw someone in very good Viking garb walking down the street in one of the shopping areas. I suppose he must work at Jorvik. Today we saw someone dressed as a Roman Soldier--lorica, helmet, the whole thing. We speculate that he must work at the pub called "The Roman Bath" that has a Roman bath in the basement. Okay, I'm not making that up. Is that a great name or what? Ragnar would kill to be the head of the Merchant Adventurers Guild of Mooneschadowe. It was built in the 1350s but is in fabulous condition. The guild was originally called the Holy Trinity Guild and was a group of wealthy merchants who banded together to do good works. The Guild hall has a chapel on one end (the stone part) and had a hospital in the lower floor. The upper floor is a great room where they held meetings and transacted business. When the reformation came, it was not possible for them to remain the Guild of the Holy Trinity without Henry VIII confiscating the Guild Hall. So they renamed themselves and escaped having the guild hall taken away from them; although they did have to pay rent on the chapel to the King. Maggie says she'd like to have it as a house. She'd put in a big kitchen where the hospital was, and they'd install floor drains for Ox, when he decides to make a mess. The great hall is just pretty spectacular. Just look at the beams in that ceiling! It's also kind of unusual because it's got a double nave roofline. (Just look at the photos. It's too complicated to explain.) When we finished at the Guild Hall, we ate at a little tea room next to the Minster and then went into the Minster to take pictures and go to Evensong. The Five Sisters windows at York Minster are the oldest stained glass in the Minster. They date from the 12th century and are in the section of the church that was originally a Norman style church. (Remember Ely? It's like that.) I walked about and looked at all the layers of detail inside the church. There are several brass tombs on the floor that have been walked over for so long that you can't read the inscriptions anymore. After we finished with Evensong, Maggie held us a table at a nearby Cafe, while Ox and I ran around the building to take photos of the outside of the church. 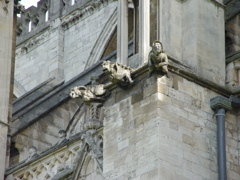 The difference is really striking, most of the Minster is covered with very gothic looking spires. The old Norman part is much plainer and more massive. Although more to my taste really. My camera batteries died just as I was trying to take those photos, so I'm afraid you're going to have to do without. I am including one of the night shots of the Minster that Ox took last night though. Perhaps I'll be able to get one of his shots of the Norman part of the church as well. I just put that up there as a heading because I thought it was a funny name for an internet bar. It was the only place that might have had internet service on a Sunday. (We were betrayed by the Novotel as well. No internet there either.) I called Saturday evening and could hear loud rock music playing in the background. The guy at the Evil Eye Lounge said he was pretty sure they had a wireless internet connection but that the bar was packed just then. Although you, as my dear readers, are probably sad that I didn't go and come report about the nightlife to be found in York, alas, I did not go. Dinner at an Indian restaurant since when we climbed Clifford's Castle on the way home, we kept smelling curry and it overcame us. Really excellent Chicken Masala. The road through Leeds however to find the next hotel was a bit stressful. If you take my advice, NEVER drive through Leeds. Park the car and get on the public transport, or drive around the city. Just don't go through the middle of it. We did arrive, although I have now spoken with a lovely Indian man who owns a gas station in Leeds, and the entire clientele of the liquor store at Drighlington. (That's pronounced, Dricklington.) I just grabbed a random Bacardi Breezer near the cash register and threw myself on the sales lady's mercy. She made one of the customers come help give me directions. Of course, all the directions had to do with... "drive to the light, turn left, go till you see the Six Acres Pub." And then someone has to interrupt, "Is that the new one? Have you been yet?" Then I had to wait for a bit of discussion on the new pub, and some old ones. But they were right. To find the place, I did have to completely disregard the instructions from the Marriott website and just go till I saw the Six Acre. When I asked the desk clerk here how to get back into Drightlington to the laundromat, his instructions included, "Go down to the crossroads where the new pub is..."
Okay, the hotel here is staffed with no one but very attractive young English men. I think I see what kind of clientele they have. Everyone was in bed by 10 when we got here, the hotel has an elevator and chair lifts, etc. etc. If I appreciate looking at the nice looking young men, does that make me one of the retired women who've come to play golf? The hotel is actually an old vicarage that has been made over into a Courtyard Inn by Marriott. Wow. This must have been some Vicarage! What little I could see looked like lovely countryside.